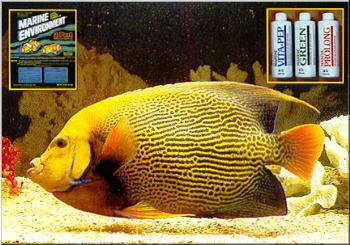 This exceptional hybrid adult angelfish is believed to be a cross P. imperator and P. semicirculatus. It is over 7″ in length. It resides a 100 US gallon marine aquarium employing 100% MARINE ENVIRONMENT® dual phase formula  for over five years. It is fed a variety of frozen foods that are soaked in MARINE VITA-PEP prior to freezing. It is also fed Tetra Marin® Flake food,, and fresh clams and shrimp, also soaked in MARINE VITA-PEP. Filtration for this display aquarium is a conventional power undergravel filter. Lighting consists of four fluorescent lamps. No UV or protein skimmers are utilized. 25% water changes are made monthly with MARINE ENVIRONMENT®.